Showering while hunting, fishing, camping and just being outside after a good hike is something that is essential and refreshing. Personally, my family has used, abused and gone through 3 or 4 solar/camping showers in the past decade. When the creator of Handy Shower contacted me I decided to accept his offer to review the product in exchange for the product. This is one of the ones I am certainly glad I accepted and did not turn down. 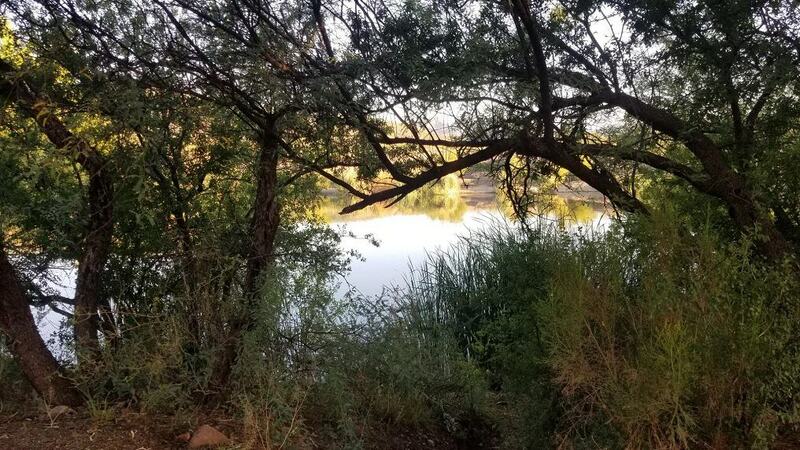 Due to former jobs and current hobbies and by virtue of maintaining a network of individuals I have been able to stay ahead of many of the innovative approaches that have come into the camping, hiking, hunting, fishing, prepping and general out-doors world! While this invention has a distinctly European feel, especially when you realize it has a bidet head attachment, this is what really makes it a worthwhile investment. I will say again, in any situation cleanliness is absolutely an essential need to remaining disease-free and comfortable. In the out of doors one can easily work up a good sweat and honestly, I find that if you are consuming enough water and not gorging on typical sodium rich, carbo based fare you will rarely actually smell and a simple rinse with clean water a couple times a day is enough to keep you healthy. However, I can also say that from experience any time you transition into a changed diet or set of external circumstances our internal setup will often rebel and the result can be mudslides or concrete if you know what I mean! If you do not have adequate toilet paper or facilities this can easily lead to potential infections not too mention looking and smelling like the hind end of a Russian hog after a Texas mud bath! I devised some fun approaches over the years and get really tired of needing to always be prepped for this. To this end I adjusted my diet permanently and my exercise level as well. That being said, keeping clean is still an essential part of daily hygiene! Handy Shower is pump based and is not gravity or battery powered. You can use your hand or the included foot-pump to keep water flowing. The way it is built you do not need anything more than a simple canteen to supply the water, though I did like and recommend the awesome bag that is included in their Premium version. The different heads for showering or washing with are fun to test and take seconds to attach and detach. As with everything, make sure you are washing your body over 50 yards from your drinking water and any open sources of groundwater or food as well as living space! I cannot stress enough the importance of having a very select place for washing up! Hand Shower which is currently active on IndieGoGo found here, offers an all in one package at a reasonable price. And after testing our unit over the course of the last week with a teenager, 9-year-old and adults attached, I can honestly say it is a winning option for campers, day hikers, climbers and virtually anyone that is active and out of doors. Let’s go over the features offered! You control the water exactly, no long turn on and shut off approaches, using a simple pull line or included folding foot pedal (which seems rickety but really does work well) you remain in control of the water flow, how fast, how much or how little is your choice! It works for washing your hands, hair or privates if and when needed and is easily switched between roles, with little fuss and no overt mess! (for we Americans bidets are a bit odd, but they really do work quite well!) never use it for that and still benefit! Empty it weighs right at 400 grams or 14 ounces, which is really quite light and packages into a small easily managed package! Set up really is very simple, first I did it without using instructions. I than checked the instructions and with one exception had everything put together properly. Easy to setup definitely easy! Durability, mine withstood the onslaught of a teen boy, pre-teen girl and other adults for several days without incident. In fact, it was so easy and fun to use that everyone kept coming to the camp to check it out as my children got around the area and met other youngsters. This led to additional uses for testing and showing them as well. It comes in a few different forms, I suggest the premium kit, however, the magic happens with the shower head and attachments themselves. So any of the kits will work for you. Unfortunately, this shower is only available on IndieGoGo. I can recommend it with two thumbs up and 5 stars all the way. As long as you treat it well it should treat you well for many years to come. The pump and attachments are well built the only real weakness I see would be in the foot pedal, it is definitely built to run with a lighter touch and not push the pedal through the floor. A harder pump does not cause it to work better, rather be smooth and consistent like you are spray painting a car and it will run well and for a long time to come! 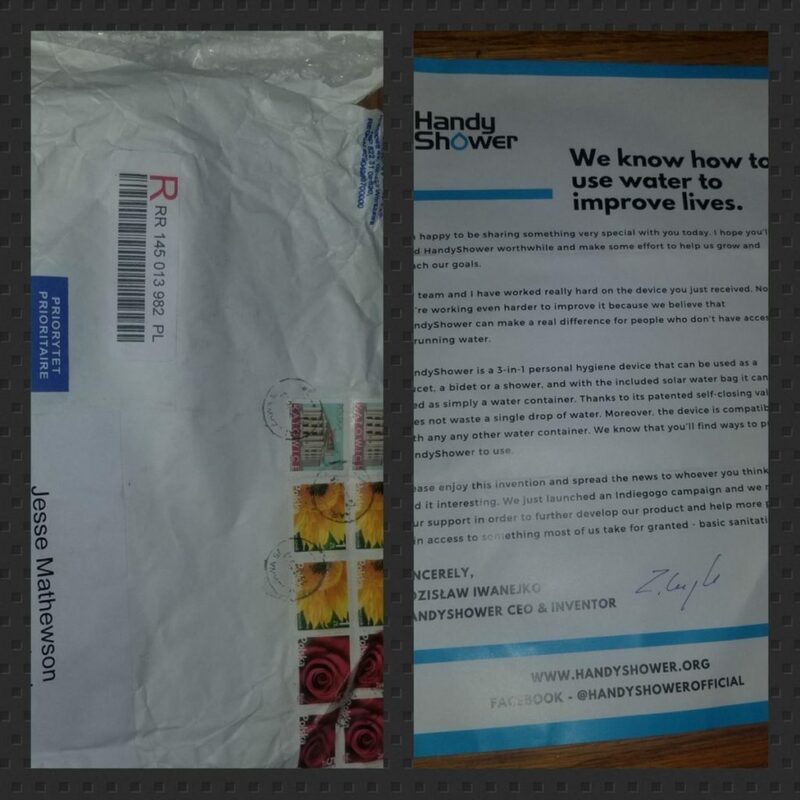 Make sure to check out the websites linked to the name Handy Shower in the article and let them know I sent you over! Get on their mailing list and definitely get one of these amazing products today! It was designed and is being made in Poland at the moment but they have plans to produce in many other places as demand increases. I have a few items I love from Poland, and they do tend to engineer in a robust manner. Additionally, it is a family run business venture and the included talent is downright amazing! Jesse, Thanks for the review. A hot shower after doing anything that makes you sweat is an almost guaranteed morale booster not to mention healthier for you. Another good tool. I have a couple of older models solar showers that work ok, will keep this model in mind for future purchase. I went to their site to purchase one and I ditto what Derek says. There is no clickable purchase link on their website. I’ve used Solar Showers for years and am a fan but really wanted to try a Handy Shower. Oops…sorry, wrong link. However, there is a donation thing. If you donate X amount, you get a kit. There is also the following link where you can contact them. Sorry, but that link didn’t work either. It took me to the same page as the other link and none of the product links were live. I was interested in the Super Early Bird Premium + Handy Shower for $33, but couldn’t make it work (or any of the others). I tried every link you posted, including looking for the donation link or a contact button and found no links that worked. Sorry but three strikes and you’re out. “It was designed and is being made in Poland at the moment but they have plans to produce in many other places as demand increases”. Yup. After an hour of searching, I discovered they are not being sold on the American market yet. Not even on Amazon. The link attached has the ability to buy. I talked to them about that and they are trying to get it listed on Amazon! To be honest, this shower looks like a fancy version of those basic black bag ones you can buy at any camping store for about $10. I have a couple of those around somewhere but never use them. I have tried 3 different brands of expensive hot-water-on-demand showers as well and returned all of them to the store. All were junk and cumbersome to use. Either the batteries didn’t last long or parts broke. And there’s nothing worse than the battery dying in mid lather! Those are just some issues. I have a much longer list of complaints about those units. To be fair, it’s been several years since I had them so maybe the products have been improved since then. My personal method is simple and cheap, and is much more effective than commercial products. I’ve used this system for multiple weeks in the remote Rockies and it works perfectly for me. It’s nothing more than 3 spray bottles, a box of baking soda, a 500ml bottle of rubbing alcohol, and a pack of large wash cloths for drying. I mix one spray bottle with 1/3 RA to 2/3 water. The RA helps cut through tougher dirt and has a nice cooling effect on those hot days. Just spray some on a cloth and start wiping. The second bottle is a mixture of water and baking soda for more sensitive areas and for quickly cleaning my hair or used for brushing my teeth. Again, just spray onto the cloth or tooth brush. The scent of toothpaste and shampoo can attract animals but baking soda will not. And let’s face it, being out in the bush isn’t a fashion competition. It’s about staying clean and comfortable without attracting animals. The third bottle is simply plain water for rinsing. You should always keep a pack of unscented baby wipes as well. They can be used for all of the above (except brushing teeth) and are easily carried in a back pack if hiking without the bulk of spray bottles. The bottles are more for a camper situation when you have ample storage. Lastly, with the spray bottle system there are no issues with warranties, returning a unit for servicing, shipping costs, or ordering spare parts if you break something. You can find spray bottles anywhere for very cheap. Those solar showers you have laying around somewhere are worth using. Back when my wife and I lived in Colorado we were cleaning up years worth of mice and packrat nests from a house and three small cabins on our mountain property. Filthy doesn’t begin to describe us at the end of the day. We were taking showers in ice cold spring water–brrrr–think purple lips. Then I bought a 4 gallon solar shower from a camping supply store. Fill it with water and lay it out in the sun–sometimes it got so hot we had to add cold water to it. My wife said it was the best $15 I ever spent. Next story What did you do to prep this week?